You are here:Home » Recipes » Have A Glass Of “Unbeetable” Juice! The recipe has been featured at Allrecipes Asia & received popular votes at FoodBuzz! Following my discovery at Picturesque Food At Tung Lok Classic, I decided to experiment with the zesty Beetroot Juice that I’d tried there, while the tang is still tickling my taste buds. So off I went, to the supermarket & selected the famous Sarawak Pineapple, 2 Beetroots & 1 Lemon. Of late, Chefs in top restaurants have been serving these bloody Beets. I read about the many benefits of Beetroots - rich in the nutrient betaine, which is important for cardiovascular health, blah, blah, blah. Because of this, I’ve tried forcing it down my throat but I simply dislike the taste – be it French, Italian or Asian styled-cooking & usually left it uneaten; till I discover the Beetroot Juice at Tung Lok. I guess the sweet Pineapple & sour Lemon somewhat helped to cover up the “raw” taste of this vegetable. These may not be the actual ingredients used at Tung Lok but it tasted pretty near & I like it! Surprisingly, my fussy son "bottoms up" the entire glass. The deep crimson colour is lovely to look at but be careful. Wash hands & equipment immediately after use as it can be staining. As a matter of fact, Beetroot dye is also used in ink. 1. Remove skin of pineapple, beetroots & lemon. Rinse thoroughly & cut into small chunks. * Remove seeds in lemon if using blender. 2. 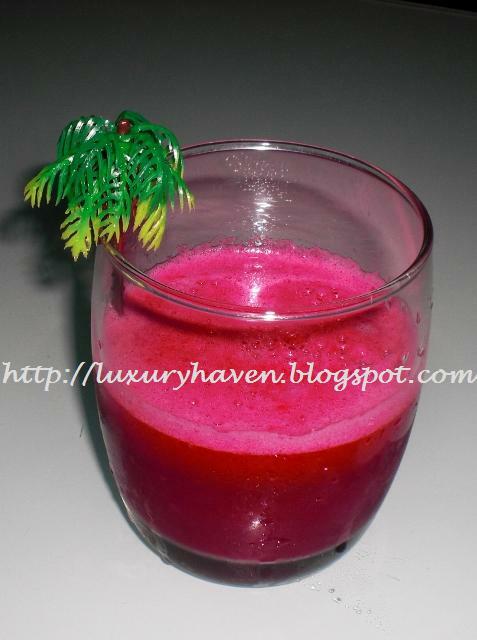 You may use a juice extractor or blender to prepare the juice. Many commercial juicers are filtered to remove fiber or pulp, but high-fiber juices are popular as these fibers contain vitamins essential for our body. 3. If using a blender, place a strainer on top of a glass to filter the juice. Remember not to remove all fiber as it’s good for health. It is said that Beetroot Juice “could save your life”, claimed the Daily Mail. So start making yours now! Nothing beats a glass of icy, refreshing juice on a hot summer day! Hey, your drink came just in time! I'm in a healthy diet now. Lovely! Awesome, it just in time in such a hot day. Thanks for sharing this nice recipe^^. I like beetroots but hate to prep it... red stains! Good meal good deal, thks for visiting! Phittera, I'm sure u'd love it! Thks for dropping by! Beetroot is definitely good for you but the earthy taste can be hard to swallow! Pineapple and lemon with beetroot sounds perfect! what a great color of juice! Simply Life, ruby red's nice.